Few things can whip up a family feud like a will that doesn’t meet expectations. Heirs who don’t agree can take their suspicions to probate court and let a judge decide the validity of a will. But before an inheritance can be taken away in Florida, there must be an examination of the facts and application of the law. This is known as due process and achieved through an evidentiary hearing. An evidentiary hearing is an adversarial legal proceeding conducted before a judge. A probate judge conducts an evidentiary hearing when an interested party contests a will. Testimony and evidence are presented to the court in order to determine whether a will is valid. In many ways, an evidentiary hearing is like a mini-trial subject to all the rules and procedures of any court. The rules of civil procedure are like highway signs. They’re designed to create an orderly traffic pattern. A person brings a will contest in a Florida probate court by filing a civil complaint. As in any civil trial in the state, the Florida Rules of Civil Procedure apply. They protect due process by governing the operations of the courts, lawsuits and parties involved. This is intended to result in a fair, efficient, and predictable application of the law. The personal representative of an estate, also known as an executor in other jurisdictions, is the person responsible for collecting assets, paying creditors and otherwise closing out the deceased’s estate. An interested party, usually a beneficiary of the will, can object to a personal representative’s appointment or press for his removal. These actions require notice and an evidentiary hearing to convince the judge the personal representative is not fit to serve. This can be done with witness testimony or physical evidence. A personal representative may be judged unfit to serve because of a conflict of interest, misappropriation of funds, malfeasance, or other unscrupulous conduct. A probate judge must hold an evidentiary hearing before a will is declared invalid or prior to removing a personal representative. In Florida, failure to conduct an evidentiary hearing opens the judge to reversal of his decision on appeal. Interested parties may contest a will in Florida based upon the deceased’s diminished mental capacity, fraud, forgery, undue influence and lack of proper execution. The statute of limitations for will contests is generally three months from the date of service, but it can be as little as 20 days in certain cases. The burden of proof is initially on the proponent of the will to show the document is valid. Then the burden shifts to the person contesting the will, who must show valid legal reasons to prevent probate. Law Offices of Adrian Philip Thomas PA: How Do I Contest a Will? Juan C. Antunez: 3d DCA/2d DCA: Are Evidentiary Hearings Required When Removing a PR or Refusing to Appoint a PR with Statutory Priority? Matthew A. Linde: Why Can't I Just Tell the Judge What Happened and Get This Lawsuit Over With? On the death of a Texas resident, the laws of probate court govern the handling of wills. Probate is the process of "proving" that the will is valid, and that its instructions conform to the law. During the probate process, the court grants letters of administration to the executor, and oversees the handling of the estate. The case begins with the filing of the will in the probate court having jurisdiction in the county where the deceased lived. An estate refers to the assets someone leaves behind when he dies. 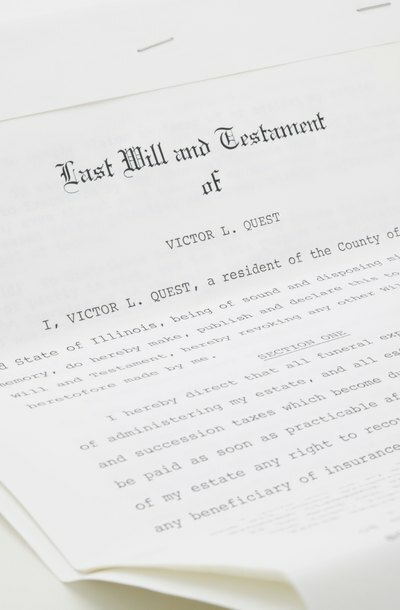 When you make a will, you typically name an executor, also known as a personal representative, to manage and distribute your estate in compliance with the terms of your will. One of the duties of the personal representative is to advertise the estate according to the laws of the state where the will is being probated. "Advertising" the estate can take various forms.